What happens when you release multiple generations of 3d printers after becoming the world’s most recognizable brand in your space? Apparently you decide to put your next generation 3d printers through the equivalent of 43 years of testing before releasing it to customers. That’s what MakerBot did before it released their newest 3d printers — the Replicator+ and Replicator Mini+. Together with the software applications that the printers use, the new generation of Replicators went through over 380,000 hours of testing. The flagship 3d printer from MakerBot has been and continues to be it’s Replicator, which boasts high speed prints and a hefty build volume for large objects. 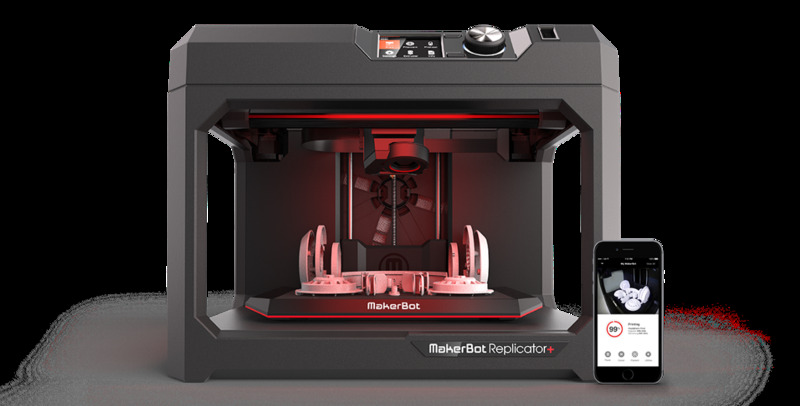 Beyond the thousands of hours of testing and strong reviews from technology publications, MakerBot has put a lot of emphasis on cloud based printing via its software applications. Users can control and monitor their 3d prints in real time from anywhere using their mobile device or desktop computer. As we’ve written previously, 3d printing companies have put an emphasis on easy to use software so that users young and old can get up and running with the technology easily. The Replicator Mini+ boasts the same cloud based 3d functionality and reliability of it’s big brother, albeit with a smaller build size. However, the true value of the Replicator Mini+ lies in its portability. It is super lightweight and can be moved to different rooms inside an office, school or home easily. Brooklyn based MakerBot has continued to innovate, pushing its machines further than most of its competitors and deserves a whole lot of credit for investing in better technology for their customers. New MakerBot 3D Printers Went Through 380,000 Hours of Testing and It Shows was originally published in 3dprintingtech on Medium, where people are continuing the conversation by highlighting and responding to this story.